From above picture, we know that Magnus Carlsen now trained with chess living legend, Garry Kasparov. From chessbase article,the goal is to make Magnus the world's number one in the course of the coming year. In complete secrecy chess star Magnus Carlsen, 18, has engaged the history's greatest chess player, Garry Kasparov, as a personal trainer. The goal is to make the Norwegian, who currently ranks as the fourth-best chess player in the world, the world's best during the course of the coming year. In addition, Magnus Carlsen of Lommedalen will be built up to become the strongest brand in international chess. "You will not find a bigger name than Kasparov," says former Carlsen mentor GM Simen Agdestein, "nor a more competent coach." When Kasparov retired in 2005 he had been an undisputed world number one from 1985 to 2000. Now the former director of the Hjemmet Mortensen, Espen Agdestein, is working full time to find sponsors for Carlsen. "This is the king training his crown prince," said Espen Agdestein. "While Kasparov is a living legend, Carlsen is the biggest attraction that exists in the chess world today. This is the Dream Team." "With so many victories coming relatively easily to his immense talent and fighting spirit, the final crucial ingredient of relentless work will guarantee his place in history," Garry Kasparov told VG. 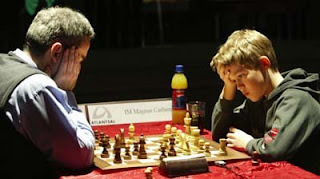 He believes that Carlsen is already very close to being number one, despite his young age. "In six months of working with Magnus I have seen in him many of the qualities of the great champions," Kasparov adds. It is estimated that Kasparov earned over 30 million US$ or 23 million Euros during his chess career, and has a staff of twenty people working for him, including chauffeurs, bodyguards and cooks. After retiring, he has written several books on chess and become involved in politics. But it is not money that runs Kasparov. "He is training just one person in the world, and it is Carlsen, because he believes Carlsen is the player with the most talent out there," says Espen Agdestein, who helped find the first sponsor for 13-year-old Carlsen. "My job now is to make Magnus a very attractive object for the market and pick the right sponsors, who can build a brand," says Agdestein. Magnus Carlsen said that he looks forward to working with Kasparov. "He has an extreme capacity for work, extreme determination to win and extreme perfectionism," said Carlsen. "Now I hope to be get more of these properties for myself. The goal is to become number one in the world."